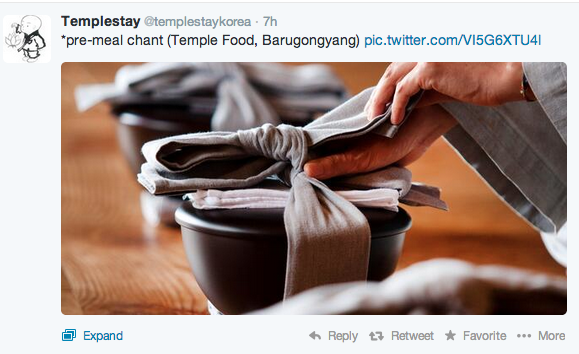 When South Korea acquired a great opportunity to renew its global image by means of co-hosting the 2002 World Cup with Japan, the Ministry of Culture and Tourism, with the Jogye leaders of Korean Buddhism, created an interesting program of accommodation and cultural experience called “Templestay.” The program was first suggested by the South Korean government in the fear that the brand image of South Korea might get worse due to the lack of the accommodations for foreign visitors. The Ministry of Culture and Tourism (currently The Ministry of Culture, Sports, and Tourism) suggested to the Jogye Order of Korean Buddhism an idea of accommodating some of the foreign visitors in temples scattered all around the country. Despite the long history of the Jogye Order emphasized monasticism against Buddhist reformism to secularize and popularize Korean Buddhism, the Ministry made a surprising compromise with the Jogye Order by promising that temples would offer not only accommodation but also the experience of Korean traditional culture and Buddhist practices to visitors. 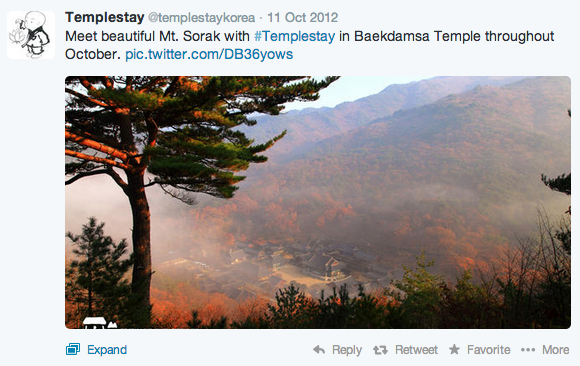 The program annually achieved an unexpected success and became one of the most popular tourist programs in South Korea. The number of visitors in the Templestay program has drastically grown from 2,000 in 2002 to 420,000 in 2011. The number of foreign visitors also has grown from 6,000 in 2005 to 37,000 in 2011. 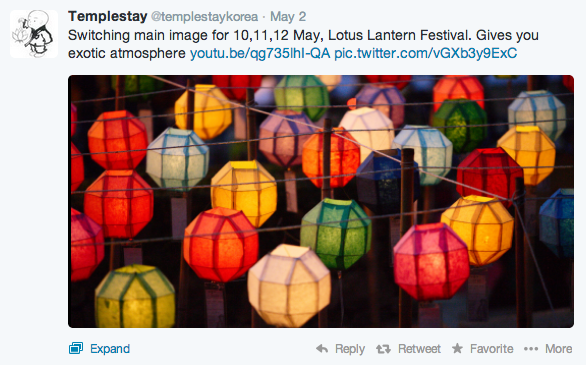 In 2009, OECD picked out the Korean Templestay program as one of the most successful combinations of culture and tourism in the report “the Impact of Culture on Tourism.” Korean Buddhism did not lose this perfect chance for its global promotion. The Cultural Corps of Korean Buddhism, which has functioned as a connection between the ministry and the Jogye order, branched out with a variety of digital media with multilingual access: the official websites, YouTube, Facebook, Twitter, Pinterest, E-Book, mobile app and iTunes. It is noteworthy that only via the English website can one be connected to other social network media (Facebook, Twitter, and Mobile app) and to the websites offered in five other languages: Japanese, Chinese, French, German, and Spanish, while the original Korean official website does not offer such multilingual and social network media access. 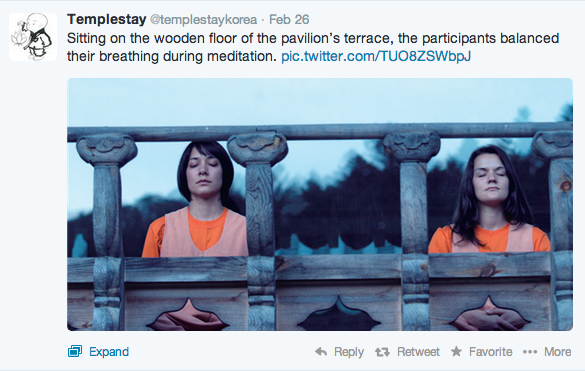 Given the eagerness of Korean Buddhism to promote itself to foreign visitors, the self-representation of Korean Templestay to the globe and its use of digital media is fascinating. 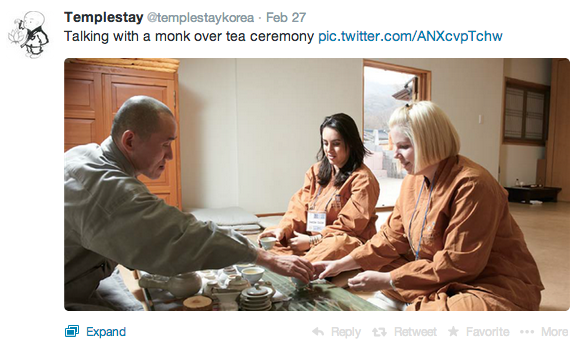 While the official websites focus on offering abundant information on Templestay including its history, temples, and travel information, other digital social media appear to focus on the making of a particular brand image of Korean Buddhism and Templestay. 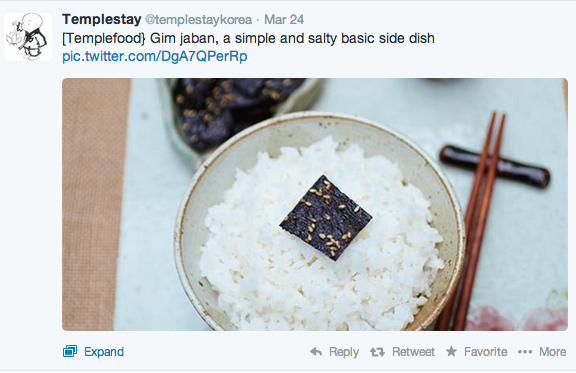 Contrary to the official website, most Facebook posts and Twitter mentions do not deliver a large amount of textual information about what Templestay is. Rather, they just capture and show some instances representing how everyday lives in the Templestay program look like with photogenic visual images and very short texts. The content of the texts is in general connotative and poetic and is displayed with the photographic images of tea (set/ceremony), beautiful nature around temples, calm meditation, organic temple food, and the seemingly peaceful and happy foreign visitors experiencing the Templestay program. One could hardly find in them any Buddhist doctrinal teaching, institutional news, or the images of clerics who look authoritative and boring. Instead, most of them represent the images of monasticism, peacefulness, serenity, spirituality, and traditional Koreanness which would look simple, pristine, naturalistic, authentic, and thus attractive and desirable to the eyes of the global metropolitan citizens having a busy, complex, and modernized late-capitalist lifestyle. The English Templestay video clip uploaded onto YouTube impressively shows such self-representation of Templestay with its narrative of comparison between metropolitan lifestyle and Templestay. In its opening, the videoclip shows four contrasting images between our hands, feet, thinking, and eating in a cosmopolitan city and those in a temple. While one’s hands in the city touch computer keyboard and smartphone screen, one in the temple calmly prays, grabbing Buddhist beads with his or her hands. While people busily step up concrete stairs in the subway, the Templestay visitor slowly walks up stone steps in the temple. After showing these scenes, English subtitles, without any voice (silence), read “give peace to your busy hands” and “allow your feet to relax.” While one in a skyscraper elevator keeps ascending, the Templestay visitor bows down in his Buddhist spiritual ritual. Then, English subtitles read “humble your mind and lower yourself.” Above all, it is noteworthy that the videoclip relates such lifestyles with habits of the self by representing each comparison between the cosmopolitan lifestyle and Templestay with the titles of “the habit of hands,” “the habit of feet,” “the habit of thinking,” and “the habit of eating.” In this very connotative way, the videoclip shows to the viewers how outer environments differently shape our habits of body and mind, that is, those of the self. In this regard, the videoclip represents Temple Stay not as a mere tourist attraction but as an ideal space (and experience) where one could transform his or her habit, body, mind, and self to “find the True Happiness within” oneself. At this moment, this seemingly naturalistic, oriental, and spiritual space (and experience) is delineated as a cure for the metropolitan who lost one’s authentic self by the artificial, Western, and secularized lifestyle shaped in and through late-modernity and globalization. Despite this self-representation of naturalness, orientalism, and spirituality against modern, cosmopolitan, and late-capitalist lifestyle, however, what this video clip narrates about the goal of life and the means to achieve it is very familiar to us: that is, the dominant neo-liberal narrative of human lives where the purpose of life is the personal pursuit of “happiness” and to find one’s “true self” is critically essential to one’s self-empowerment and self-transformation that neo-liberal society proposes as the ethics of the self. 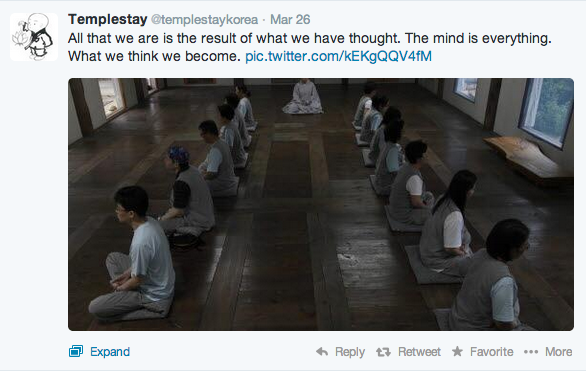 What I want to argue is not that this Korean Templestay program is a banal product of neo-liberal market which commodifies almost every area of human lives, as we see above, including religion, spirituality, tradition, national heritage, travel, and experience. It appears to need more cautious explanation on what happens in the self-representation of Templestay negotiating between the local and the global, the commodity and the authenticity, the market and the religious, and the physical and the digital. The project of finding one’s true self, which Korean Templestay is actively embracing, would be one of the critical themes that reveal the inevitable negotiations that Korean Temple Stay has to make in order to survive and promote in this late-modernity. It is very interesting to see how much actively Korean Temple Stay embraces the Western and modern project of finding one’s authentic self that became a powerful moral ideal (Taylor, the Age of Authenticity, 1991) on a global scale (It is a Western project in a sense that, in its origin, the idea of the authentic self is deeply rooted in the self-interrogation of intention that is the Western Protestant technique of the self. It is also a modern project in that the capitalist mode of production and increasing social mobility became a condition that the desire of authenticity explodes (Lindholm, Culture and Authenticity, 2007)). 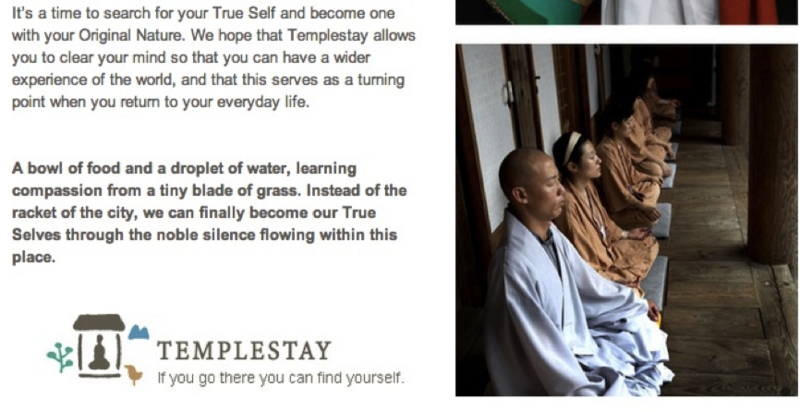 In the last two paragraphs of the “About Templestay” section, which is the most text-laden section and offers the most explicit explanation about its identity, it reads that “it’s a time to search for your True Self” and asserts that “we can finally become our True Selves” by certain silence flown within temple. Given its self-representation, to put it roughly, it is the space of temple that authenticates one’s self. 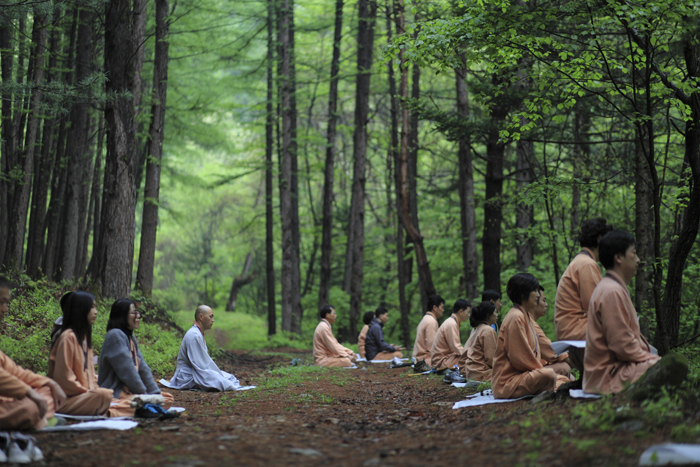 One can find and realize one’s true self through and within the space and experience of the Templestay program. In this way, Templestay in digital space authenticates itself as an authentic space and experience to find one’s true self. Furthermore, the terms of “find” and “search for” tend to offer an impression that there already seems to exist a substance that one could search for and work on. In this regard, such phrase of “search for your True self” appears to presuppose one’s substantial self which exists as an essence waiting to be found by the modern self. Interestingly, however, such assumption on the self is quite far from the original Buddhist teaching of the self. The Buddhist doctrine of Anatman (no-self), in fact, teaches that there is no essence and eternality on the self. For instance, in his book Self and No-Self (2009), Osamu Ando illuminates that in the Buddhist understanding “the self is constituted, not of a substantial essence, but of thought, although we might mistakenly regard it as an essence that ‘exists (p.10).’” In this regard, this rhetoric of finding one’s authentic self sounds more like that of spiritual tourism in which Korean Buddhism endeavors to attract cosmopolitan and/or foreign (mainly Western) visitors who long for the finding and fulfilling of their alleged authentic selves apart from their complex, busy, and secular lives. Nevertheless, if we attend to the fact that the idea of the authentic self has a particular conceptual history intertwined with Western and modern conditions and that the binary between the authentic inner self and the outer commodity corrupting the authenticity of the inner self, has been shaped surrounding the Western idea of the self (and given to us), such binary between the authenticity and the commodity would not need to be embraced as an absolute and unchanging truth. What the comments of visitors on Temple Stay in digital space show is, in fact, that the visitors seem to experience something, make meanings about their lives based on the experience, and express their own feelings about them. And all these experience, meanings, and feelings are not something that others can objectively categorize as authentic or not. To conclude, the examination about the intertwined relationships among Korean Templestay, neo-liberal market, and digital media offers a chance to see Korean Templestay as something in-between the traditional and the modern, space and experience, tourist attraction and national heritage, popular culture and the religious, the religious and the market, the physical and the digital, the local (South Korea) and the global, the secular and the sacred, and the commodity and the authenticity. In fact, both the social and personal experience on the Templestay produce and even thicken such in-betweenness and hybridity between the binaries. When Templestay embraces the modern and Western ideal of finding one’s authentic self, when it authenticates itself as a lived museum of traditional Koreanness, thus when Korean Buddhism has to negotiate its location with(and within) popular culture, neo-liberal market, digital media, ultimately (late)modernity, it is inevitable that such in-betweenness and hybridity between the binaries emerge.